Holla Mohalla is a Sikh festival celebrated in the Bikrami month of Phalgun. It has nothing to do with Holi except that Holla falls on the day next to Holi. The festival was founded by Guru Gobind Singh, the tenth Sikh Guru. The Guru was in the midst of fighting both Aurangzeb of the Mughal Empire and the Hill Rajputs, and had recently established the Khalsa Panth. On March 7, 1701, Guru Gobind Singh started a new tradition by overseeing a day of mock battles and poetry contests at Lohgarh Fort. The tradition has since spread from the town of Anandpur Sahib to nearby Kiratpur Sahib and the foothills of the Shivaliks, and to other Gurdwaras around the world. One Universal Creator God. By The Grace Of The True Guru: I serve the Guru, and humbly bow to Him. Today I am in supreme bliss. My anxiety is dispelled, and I have met the Lord of the Universe. Today, it is springtime in my household. I sing Your Glorious Praises, O Infinite Lord God. Today, I am celebrating the festival of Phalgun. Joining with God’s companions, I have begun to play. I celebrate the festival of Holi by serving the Saints (Lord). I am imbued with the deep crimson colour of the Lord’s Divine Love. My mind and body have blossomed forth, in utter, incomparable beauty. They do not dry out in either sunshine or shade; they flourish in all seasons. It is always springtime, when I meet with the Divine Guru. The wish-fulfilling Elysian Tree has sprouted and grown. It bears flowers and fruits, jewels of all sorts. I am satisfied and fulfilled, singing the Glorious Praises of the Lord. Servant Nanak meditates on the Lord, Har, Har, Har (God). It is said that festival of Holi has existed for over two thousand years. However, the MEANING of the festival has changed over the years. Earlier it was a PAGAN FESTIVAL of a special rite performed by MARRIED WOMEN for the happiness and well being of their families and the full moon (‘Pooran-Maashee’) was worshiped, marking the new SPRING SEASON. 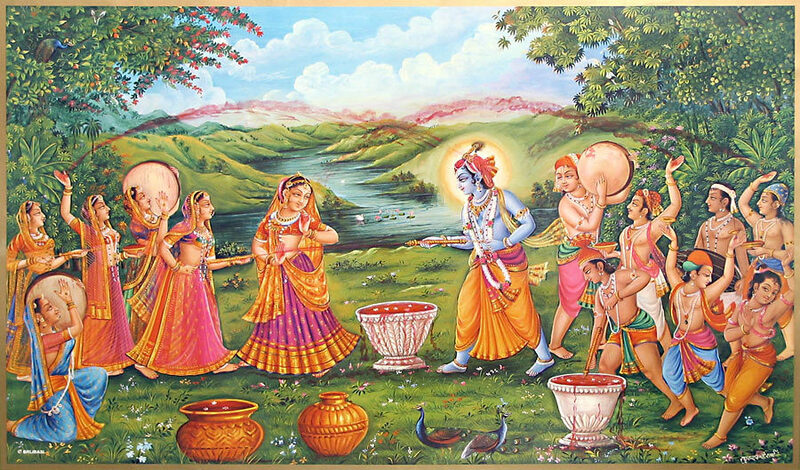 Mythology also associates KRISHAN (whom Hindus revered as a god) with playing with colours and starting the tradition of throwing colours at his child-hood lover Raadha and other gopis (cow-herd maids), who were also his lovers. Gradually, the play gained popularity with the people and became a tradition. This illustrates the MANMAT nature of Holi where men would become playful with women. (What is Holi?) I celebrate the festival of Holi by serving the Saints. The literal meaning of the word ‘HOLI’ is ‘BURNING’. One historical interpretation of Holi is of being originated from the word ‘HOLIKA’. Holika was the name of the Bhua (paternal-aunt) of Bhagat Prahlaad jee. Harnaakash was a powerful king who had earned a lot of spiritual powers through devotion to God, but he became very ego-centred and wanted all his Kingdom to worship him only. He wanted to KILL his son Bhagat Prahlaad jee for worshipping WAHEGURU instead of his FATHER. He was TORTURED in many ways but he didn’t waver. 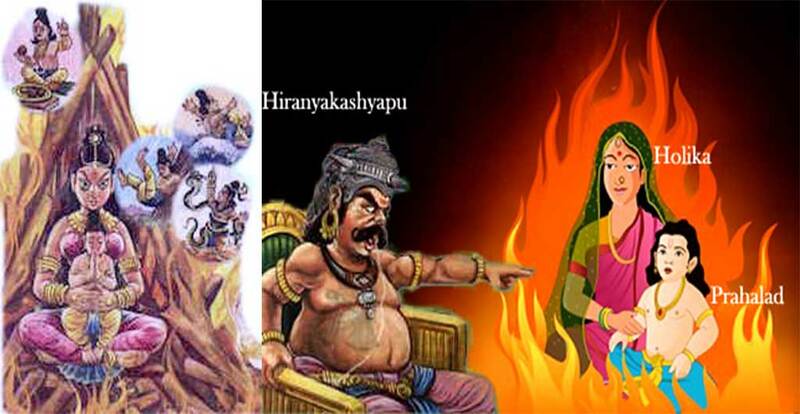 His Bhua (aunt) Holika volunteered to hold Prahlaad in her arms and sit on a FIRE. Holika had a boon (ਬਰ) whereby she could enter fire without any damage on herself. However, she was not aware that the boon worked only when she enters the fire alone. Bhagat Prahlad jee was SAVED and Holika BURNT to ashes. Hindus commemorated this day to celebrate the victory of good over evil. Holla Mohalla is a three-day festival that takes places in March, following from the Hindu festival of Holi. “Mohalla” is a Punjabi word that implies an organised PROCESSION in the form of an army column accompanied by war drums and standard-bearers, and proceeding to a given location or moving in state from one Gurdwara to another. Holla Mahalla or simply Holla is a Sikh event, which takes place on the second day of the lunar month of Chet, which usually falls in March. Mahalia, is a Punjabi word that implies an organized procession in the form of an army column accompanied by war drums and standard-bearers, and proceeding to a given location or moving in state from one place to another. Holi, when people playfully sprinkle colored powders, dry or mixed in water, on each other on the first day of Chet was given a new dimension by establishing Holla to be celebrated a day after. 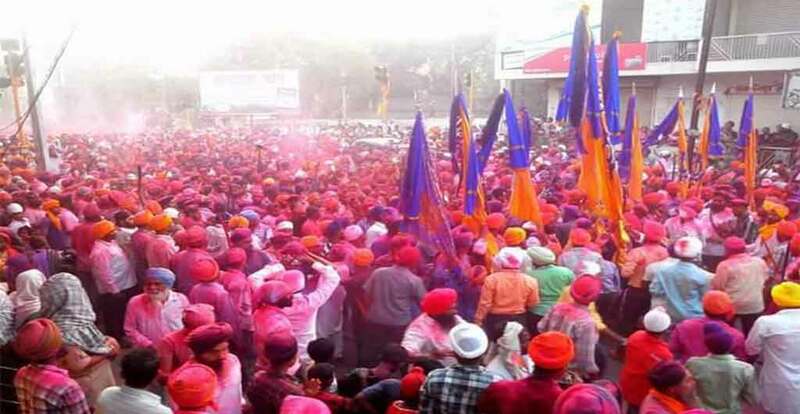 However, Guru Gobind Singh (1666–1708) held the first march at Anandpur on Chet vadi 1, 1757 Bk (22 February 1701) and therefore festivities start before the second of Chet. In Anandpur Sahib, the festival lasts for three days. The Guru made Holla Mahalla an occasion for the Sikhs to demonstrate their martial skills in simulated battles. This was probably done forestalling a grimmer struggle against the imperial power and channelizing the energy of folks to a more useful activity. Holla Mahalla became an annual event held in an open ground near Holgarh, a Fort across the rivulet Charan Ganga, northwest of Anandpur sahib. The popularity of this festival may be judged from the fact that out of five Sikh public holidays requested by the Khalsa Diwan, of Lahore in 1889, the Government approved only two – Holla Mahalla and the birth anniversary of Guru Nanak. Holla Mahalla is presently the biggest festival at Anandpur. It will be appropriate here to discuss briefly the town and the participants of this festival. Anandpur Sahib (lit. City of Bliss) is situated on one of the lower spurs of the Shiwalik Hills in Ropar District of Punjab and is well connected with the rest of the country both by road and rail. It lies 31 km north of Rupnagar (Ropar) and 29 km south of Nangal Township. Being one of the supremely important historical centers of the Sikhs it has been reverently called Anandpur Sahib. It was here at Anandpur that on Baisakhi of 1699, Guru Gobind Singh inaugurated the Khalsa and the Panj Piare (the five beloved ones); hence inaugurating the order of Saint-Soldiers who pledged their dedication to defend the needy, poor and oppressed and their respective social, economic and political rights. This was a tradition of one of World’s greatest Martyrs Guru Tegh Bahadur (the 9th Guru) who laid down his life in the defense of the Hindus on behalf of the Pandits of Kashmir.